Berkshire Bellydance Artist & Teacher - as seen on TV! Have you always wanted to try bellydancing and want a friendly learning environment? Find out about our classes and our specialist workshops! Rachel and her sparkly team of teachers train students in the art of bellydance for fitness, fun and fabulousness! Gain self-confidence and enjoy the health benefits and well-being bellydancing brings. Are you a bellydance fan looking for a new challenge and more student performance opportunities? See the RBSB students in action! 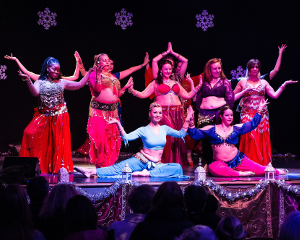 Students enjoy precious 'me-time' and exciting social opportunities celebrating their achievements through performance, costuming and spectating at bellydance events. Hear about our students' experiences and success stories. Develop your skill as a dancer, from beginner to advanced level and beyond whilst gathering essential cultural and academic insight into Egyptian dance and music. Click on the photo below for our stunning student performances! Rachel is a popular bellydance coach, mentor and fully qualified teacher (QTS). She is also a Fitness Instructor (CYQ Level 2) and offers weekly bellydance classes, workshops and private tuition to all ages and levels. Rachel absolutely loves to teach bellydance and is proud to have turned her hobby into her full-time dream career. To engage Rachel to perform at your special event, click here. Watch the video below to see Rachel dancing to "Visions from the Emerald Within", at Planet Egypt. Music by Hossam Ramzy, available from www.hossamramzy.com. Rachel Bennett is a much sought after full-time bellydancer, qualified teacher and fitness instructor, known for interpreting the music to the max! Students have trained with Rachel Bennett School of Bellydance since 2008 for fitness, fun and fabulousness in Windsor, Maidenhead & Wokingham, Berkshire, UK. Rachel and her sparkling, kind and caring teaching team specialise in Egyptian dance styles, Fusion elements, Props, Musicality, Technical Training and Performance Technique. We can’t wait to nurture your dancing and help you achieve! Rachel has taught and performed at UK bellydance festivals and she also runs workshops, multiple student performance events, teacher training courses and bellydance business school for dancers and teachers entering the professional world of performance and teaching. In 2018 Rachel founded Bellydance Heaven in Windsor, Berkshire; a festival of workshops in a day, hosting UK National and International Stars of Bellydance. Rachel performed with the Dance Company of international stars Hossam Ramzy and Serena Ramzy featuring as a solo artist in concerts and on tour with them from 2007 to 2012. She is one of the first graduates from the “Drumzy” Ramzy School of Music and Dance. Rachel’s credits incorporate regular performances in theatres, at corporate events, parties, weddings and she has held multiple long-term restaurant residencies. Rachel has frequently performed at London bellydance events: Planet Egypt, Arabesque Nights and the Silk Route Arabian Dance Cabaret Showcase. Her national TV work includes the Mark Summers episode of "The Boss is Coming to Dinner" (Channel 5 and the Discovery Channel). Rachel absolutely loves to teach bellydance and is proud to have turned her dance hobby into her full-time dream career. To explore training with Rachel Bennett School of Bellydance, click here. Watch the video above to see Rachel dancing to "Visions from the Emerald Within", at Planet Egypt. Music by Hossam Ramzy, available from www.hossamramzy.com.